One of the top concerns my clients have before we start working together is if I will make them throw away things they want to keep. I won’t ever force you to discard your beloved items. 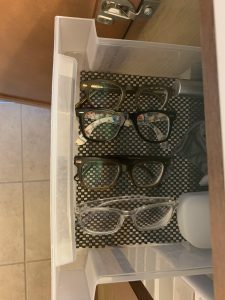 If you’re wondering “can I get organized without throwing things away?” the answer is ABSOLUTELY! As you start to think about organizing the things in your home, here are some of my favorite helpful tips. When I am in people’s homes, I often see under-utilized storage space. Look around your home and see if you can go vertical. Ladder shelves. Tall bookcases. The empty space at the top of closets and cabinets. Sometimes you can even add a shelf at the top of closets and gain even more storage space. Boxes, labels, shelves, bins, baskets — you get the idea! My first disclaimer here: you don’t have to buy products. You can use the box your iPhone came in or an old shoebox to store your belongings. I’ve found really cute storage options at the dollar store, too! To create more storage space where there was none before, containerize and stack your things. Sometimes there could wasted vertical space like I mentioned before, but you might be struggling to make use of it because of the size/shape of the items you want to store in the space. 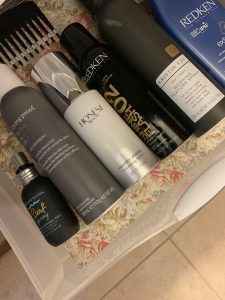 Consider using boxes to make use of the empty space – stack it up! There are inexpensive rods you can purchase to create an extra row/shelf in your closets to hang clothes. Make use of empty lower closet space with these hanging rods! Organizing products can “create” space, make better use of the space you have, and bring order to that space. Some people store things in places that aren’t well suited for the items. 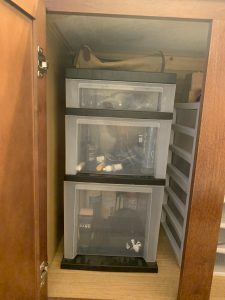 Putting light bulbs and batteries in kitchen drawers when they maybe should be in the garage or laundry room. Putting kitchen manuals for your fridge and microwave in the kitchen drawer taking up prime kitchen real estate, when all household manuals could go together in a box, located at the top of the closet. While many people keep their medicine in the kitchen, often people run out of space in their cabinets (again: kitchen space = prime real estate). Put less-used first aid items in bathroom or linen closets to free up kitchen space. Another hot spot: under the bathroom sink. It’s usually a big, open cavity. People pile stuff in and don’t use the empty space above. Get an organizing product to take advantage of that big cavity. 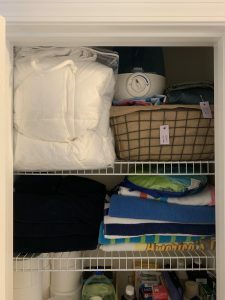 If you have sink storage AND closet storage in the bathroom, you could put towels below the sink and put products in the linen closet. The big takeaway when relocating items: group like items with like. Don’t put your lightbulbs in three different places scattered through the house. Maybe you have some things laying around that are “homeless.” They just lay out on counters or on the floor because there is no existing logical place to put it right now. They need a home! The mail goes here, extra toilet paper goes there. Create a home for your homeless things. 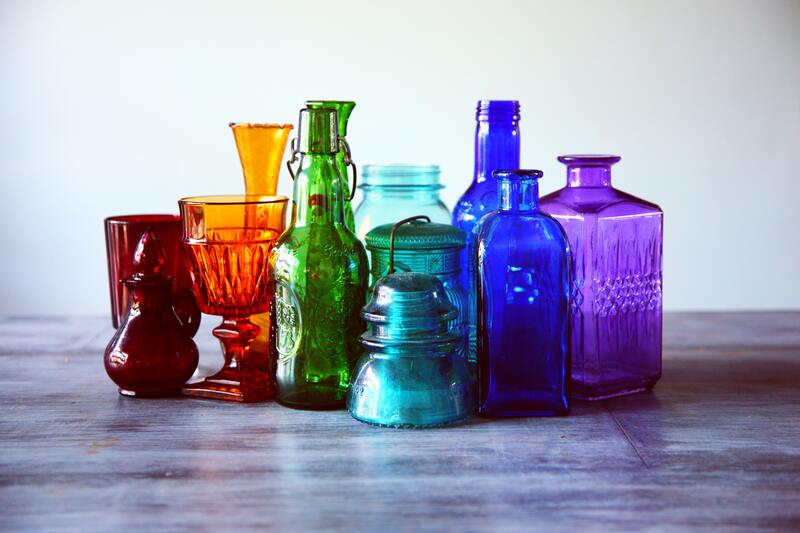 If you dedicate a space for loosey-goosey items, you can create more order in your home. Recently, my husband asked me to put some new items he purchased in the garage. I walked out there and – man! It was FULL! Most of my clients would say to me, ‘there is no room out here,’ but I’ve learned to flip my thinking on ‘full’ spaces. It was a packed garage, but I knew if I moved some things around, I could create a new space for these items. I thought about where I was wasting space that could be created. And sure enough, I moved some old basketballs and broken rackets, and voila – space! Another great story: One of my clients had an old TV armoire. She moved the TV and mounted it on the wall. The armoire sat empty. I looked around and there were board games on the floor behind the chair and more board games in a closet down the hall. 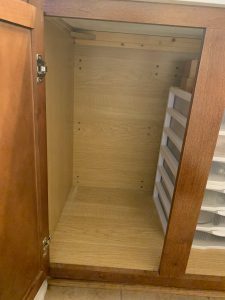 I saw an opportunity in that empty armoire – game storage right in the family room! We even had room to store other large bulky items. Keep the items you love, find new homes for them. Declutter your home, reclaim your space! 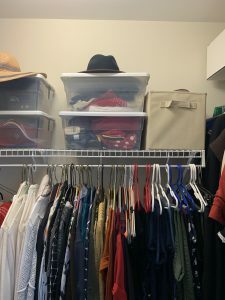 Newer Post 10 Easy Organizing Tips	Older Post Do you have too many clothes, or is your closet too small?